Everything you need to get you started in witchcraft and how you can incorporate this peaceful and powerful craft into your daily life where it counts the most. In ancient history witchcraft was termed as the "craft of the wise" since the practitioners who followed this path were in perfect harmony with the forces of nature. 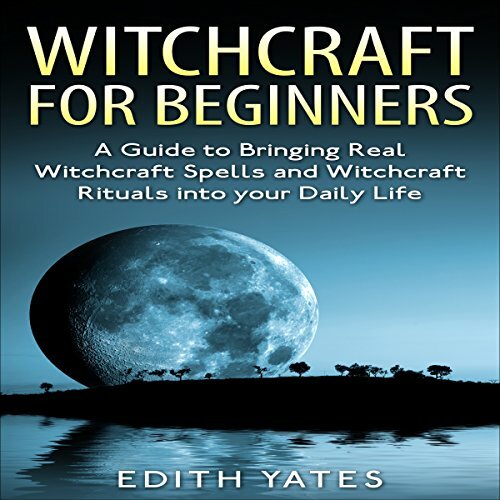 In this book you will find out what real witchcraft is, and also, more importantly, how you can start on the path of incorporating this craft into your life. Before the name of witchcraft was tarnished by the religions of the time, magic practitioners of all walks of life were extremely revered from different regions of the world and were the seers, healers, wise ones, rainmakers, medicine men and women. They practiced magic in one way or the other. The narrator is perfect, but the book gives the impression that the majority of witches are Wiccan. This is false. Wicca is a religion, witchcraft is a craft. Some Wiccans are witches, but traditional witches are generally not Wiccan. Wiccans have hijacked the craft as their own, and this is the impression that society has. It's simply not correct. Only some witches are Wiccan. Wicca goes back to the 1950s whereas witchcraft goes back centuries. The book was easy to understand for beginners. It talked about the beginning phase of witchcraft. It was a great read. This book is perfect for someone who doesn't know where to start! its basic and not too long. it's very easy to understand. Now I have a little more confidence to read other materials. Loved it it was very interesting and easy to follow and the spells was easy to follow and perform.